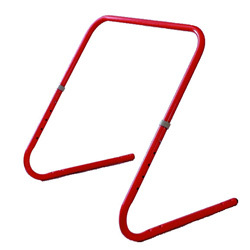 This Ice Skate Trainer is a great training aid for young and little ice skaters just taking to the ice. So much better than trying to hold them up! Works like a "WALKER". The child leans slightly forward holding the bar and this really helps support their own weight. The Ice Skate Trainer works really well! If you have ever struggled with trying to hold a toddler or pre-schooler up from behind you will totally understand why this Ice Skate Trainer works so well and is so wildly popular! The Ice Skate Trainer comes with full instructions and can be fully assembled in minutes and it requires no special tools at all. 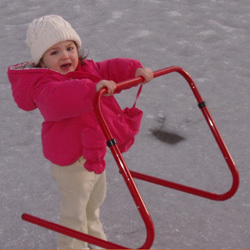 This is a very durable and well-constructed item to help your little ice skater. This unit will adjust and grow with your child easily as they grow or as other children use it to help them learn to ice skate. We stand behind all of our accessories. Please check out our Helmets, Stick Sets, Goal Nets, and Pad Sets. GREAT ITEMS at GREAT PRICES! Sturdy steel construction. Width 24" Height 28" fully extended can be shortened to 20.5" in 6 adjustments at 1.5" increments.